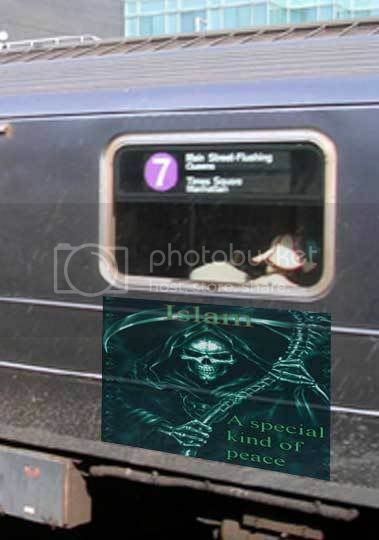 When I read that an unindicted conspirator in the 1993 World Trade Center bombing was kicking off a marketing campaign for Islam on the New York Subway System this morning, my gears started spinning. BELIEVE IT IS OR YOU ARE A HATEFUL INFIDE... HATEMONGER!!!!!! Can you help the unindicted conspirator come up with more marketing material? Feel free to share your photoshop creations down yonder—If you have trouble figuring out how it works, just drop me a note. Coming soon to a city near you? YOU'D BETTER BELIEVE IT!!! haha, yeah, for real. Those ads are more like it. When we heard of this ad campaign we did a search on YouTube for Siraj Wahhaj the terrorist and his group called the Islamic Circle of North America. Everyone should check his videos out and then flag them for removal. (YouTube Smackdown). Just another ignorant stereotyped opinion that wants to spread hate..
just like Hitler did... You are no better. People like you were responsible for opening up the doors of hate in Europe that allowed Hitler to power. Well done mate.. Great achievement. I am Humaira Nazeer from Muslim family and I have completed my all Islamic study from Islamic Institution of Toba Tek Singh . Today I have visited your website.Its realy wonderful work.I have desire to become the part of your Organization . I am able to do translation work.If you have translation work this is my request kindly contact with me. I am able to do Translation and recording work in some Pakistani Languages.